Instagram Message: This foursome is stylin' in their bling caps. Thanks for putting on a great event and for these thoughtful pinches Kristin! 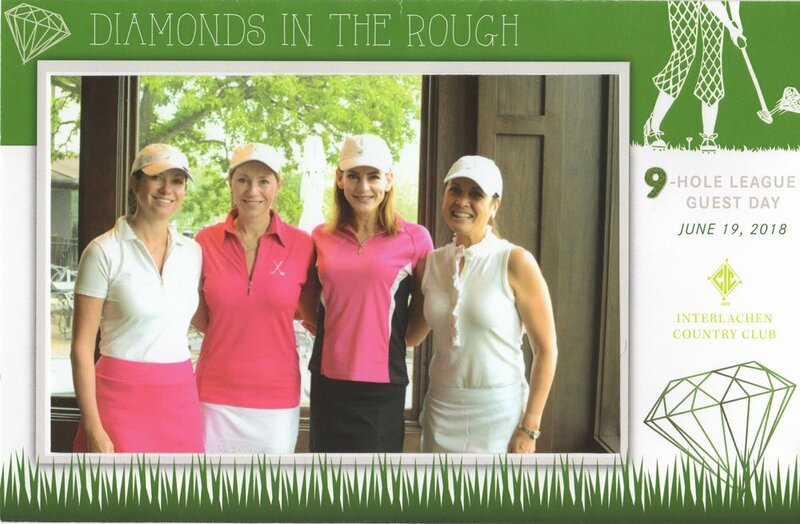 Last week I played in a nine-hole golf tournament, the theme was Diamonds in the Rough. Players were encouraged to get into the theme by wearing sparkling accessories and outfits. Because I previously played with my friend Kristin in another tournament two summers ago, I was really surprised that she invited me to play in her foursome. Even more surprising was that the invitation still stood after I confessed that I didn't touch my clubs for 1.5+ years because I had been working on my tennis. When I arrived at the club as Kristin's guest for the nine-hole tournament, I found out that she was the Chair of the event. What an honor! And because being invited wasn't enough, as a thoughtful pinch, Kristin gave each of her foursome a cap. Appropriately perfect to match the theme and yet practical because it kept most of the rain off of our faces (yes, it rained the entire time). The hat is a souvenir of playing in a tournament that turned out to be a pivotal moment for my thoughts about golf. I had been really nervous for 2 weeks prior to the event but I realized during the tournament, after the second hole, that I couldn't get any worse than I was the day before. I will always remember the feeling I had playing this game. Was I any good? Hell no! Did I have fun? Hell yes! During this rainy tournament, a light bulb went off for me and my Type-A personality took a back seat: If I'm turning forty-nine soon and I hope to live until I'm at least ninety - I have plenty of time to get all the rules straight, proper etiquette, know which clubs to use, etc. Obviously, I'm not going pro in this lifetime so why was I in such a rush to master this game in a year or two? After the second hole, I relaxed and just let everything soak in (literally). A bling accessory that perfectly topped off our foursome outfits . I pinched a friend named Kelly with this cap. Kelly is one of the very few female staff members of a scouting department within the entire NFL. I'm so proud of her and very glad that she is on our team. She will rock this hat and it will have a completely different meaning for her than it does for me. Recently, I tagged along with the hub on his business trip to Fort Lauderdale. We had drinks after he and his co-workers had attended an all-day conference. Drinking ice cold Coronas and listening to a live band in a total dive bar across the street from the beach was so much fun. I wanted to remember the moment so I bought a cap for myself and for my friend Kelly. This cap represents a rare time for me: away from home, no kids, having drinks on a Monday night with the hub. The only thing on my schedule for the next day was yoga and lunch with dear friends. For our tenth anniversary the hub gave me a very sparkly Tiffany's diamond ring. I gotta tell you, this cap came in a strong second place for my favorite anniversary gifts. Last year for our fourteenth anniversary, the hub gave me a cap as a thoughtful pinch and it made me smile ear to ear. As loud and obnoxious as this hat looks, this cap really represents easy-going family fun when we are at our home away from home. For the last two summers, we have been making memories in Costa Rica. When I see this hat, I think about this restaurant where we cook our steaks at the table on lava rocks. I think of drinking Coco Loco drinks where one is plenty. I think of family fun conversations and saving room for the addictive coconut ice cream. A few days ago, I put on the hat and the count down began. We will soon be in our happy place. Very talented and almost too generous, Carleton gave me this pinch plus three more caps just like it. We're cheering for this player! It takes a lot of nerve to show up in our Bruin home with anything representing the Trojans. But we'll make our only exception for this guy because we absolutely love him! The hub's Godson gave him this cap as a birthday thoughtful pinch a couple of years ago. It was a proud moment for both the hub and his Godson. I am so glad he signed it! We have high hopes for him and we're looking forward to watching his career unfold. Go #76! Ever since we received three of these thoughtful pinches, my son and I have been addicted to wearing these caps! Hockey Royalty is represented by these two letters. I wear this cap with pride and now I will wear it with an even a bigger heart. Larry Hendrickson, the legend who started the Hendrickson Foundation passed away on June 15, 2018. 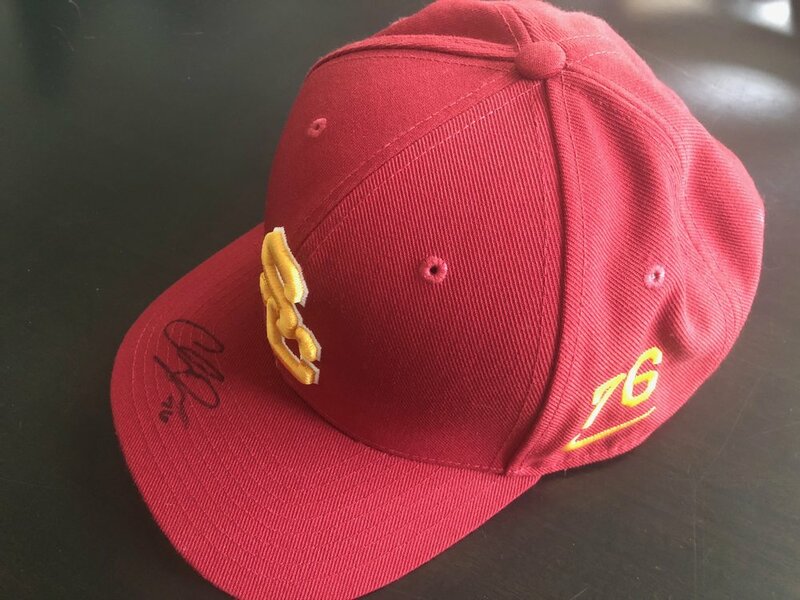 I was jokingly asked by Larry's son, Danny, to wear this cap for the foundation like I was a spokesperson or a model. With pleasure! 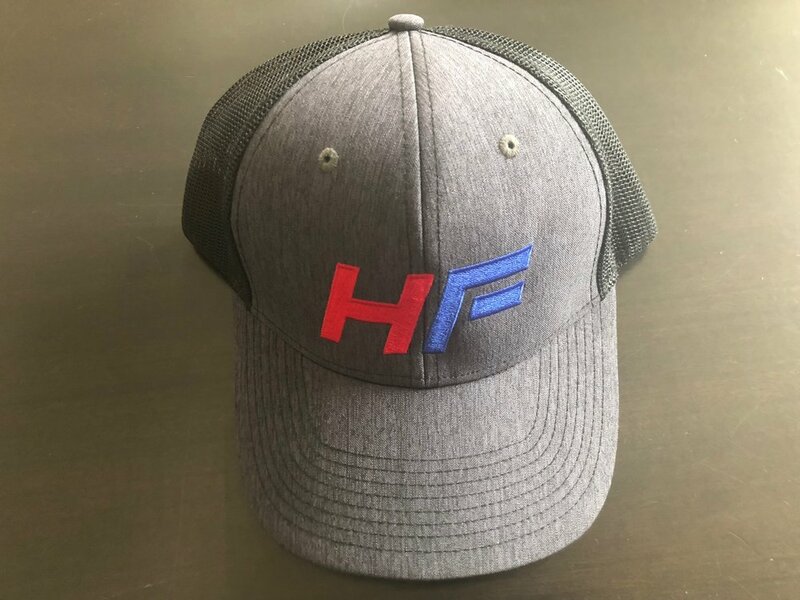 The foundation's website doesn't completely capture all of the wonderful support it offers but the quote "The Hendrickson Foundation seeks to grow the game of hockey by including individuals with mental and physical disabilities." says it all. This foundation is truly a game changer. #hockeychangeslives. Thanks Uncle John, this cap sums it up. My son received this thoughtful pinch from my brother-in-law for either his birthday or Christmas. (It's hard to keep track since both events are in December). 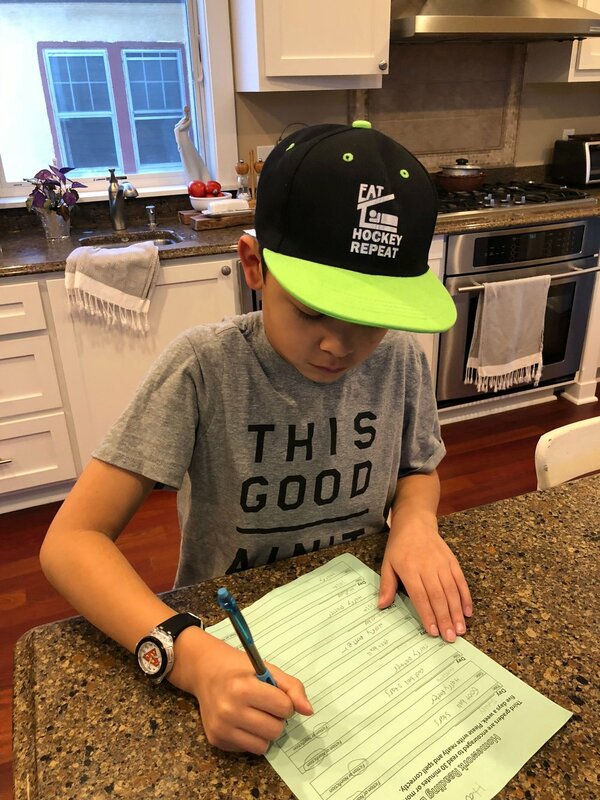 I have observed that my son will only wear this hat if he is going somewhere that is not related to hockey. Read on and decide if this is a case of "the apple doesn't fall far from the tree." You will not find me wearing the Pura Vida cap in Costa Rica or the California Love hat in California. The California Love hat was the very first cap that I bought for myself and actually wear. Growing up, I never wore baseball caps because my head is large and I never really knew why I looked funny in the female style baseball caps. I found out that it's because the bill is small so the cap sits short on my head and makes it look huge. I finally discovered the larger bills years ago while in Laguna Beach or San Clemente so I bought the California Love cap because I wanted to wear it whenever I missed my family. 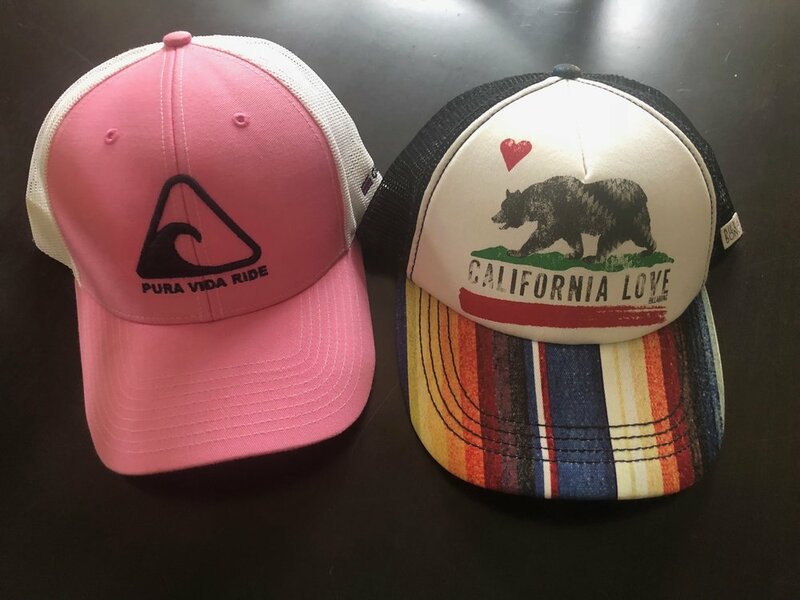 I bought the Pura Vida cap in Costa Rica when I realized that the people in that country do not just say those words - THEY LIVE IT! For practical reasons I wear caps to block the sun from my face, to hide bad hair days and to complete an outfit. However, another good reason that I wear caps is because I am an extravert and caps start conversations. When I travel, I wear caps from MN and CA because that's where I'm from. Wearing a cap, invites small talk; it's the beginning of meeting new people. I think of caps as billboards. They inform people about my likes, my interests and/or where I originate from or belong to. My thought is that if I wear my California Love hat while I'm in CA, it doesn't leave much to start a conversation because it's like a dead end. I am thinking maybe this too is the reason why my son wears his hockey hat to non-hockey related events or venues. Perhaps he is hoping that sooner or later someone will want to talk to him about hockey. Caps are fun yet practical thoughtful pinches. The hope is when the recipient wears the cap, good feelings and thoughts ensue.